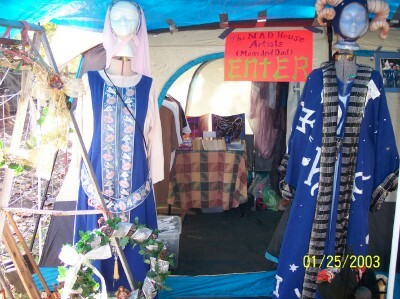 These costumes are all-purpose Medieval/Renaissance faire costumes. 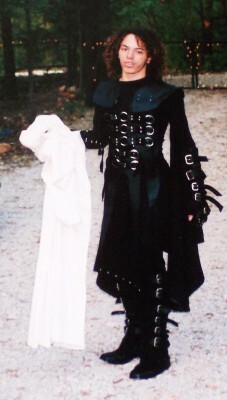 In this 2004 picture we were headed for the Faire on Kimball's birthday, May 22nd. The curly-headed one graduated with a Bachelor's degree in Computer Game Design February 2008, the Wizard joined the United States Marines and finished Basic Training in October 2007, and the one in the red liripipe hat is working full time in the Fast Food Management. Quite a group...We enjoy Medieval and Renaissance Faires, and like to attend Fully Garbed. From 1976 to 1987 Mom worked in New York, first as a dancer with Bhaskar: Dances of India, and later as a costumer. Mom likes nothing more than realizing YOUR costume design for you to wear. Costume construction is her specialty. Making the collars and tails for the American productions of CATS! from 1982 until 1987 was one of her proudest achievements. In the Parsons/Meares Costume Shop, together with Ms. April Guttierrez, Mom helped document the construction of each tail used in CATS! in a book called a 'Tail Bible' which was used for continuity. But you really do NOT want to raise children in New York City, so that was that. It was fun using the left-over pieces from the real Broadway costumes to make this Halloween costume (pictured above) for Mink. The Collar was a gift from the Costumer with the CATS! Road company, and happens to be one that Mom made in New York all those years ago. The costumer toured Mink around the stage and costume area at the Tulsa Performing Arts Center main stage and last she opened a drawer of collars that had been retired and told Mink to choose one. Imagine Mom's surprise when she examined the chosen collar and recognised the work! 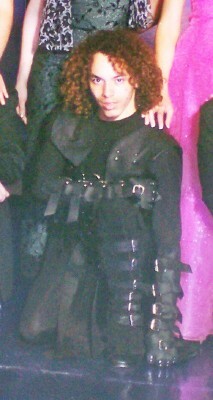 Here is this Fellow again, as he prepared to attend the High School Prom in May of 2005. Not only a designer of computer games, Kimball is really quite a remarkable artist and Costume Designer. This costume is available for orders of copies. Please feel free to inquire by email: zelda@brightok.net. These are a few details of the Straps & Buckles Costume Designed by none other than our Kimball. This is one that Mom made for an international corporation (above). In fact Mom and Kacie, Denesa, Sydney, Chelsea, and Aunt Jobie managed to construct ten of these for use by the executives in seminar settings. 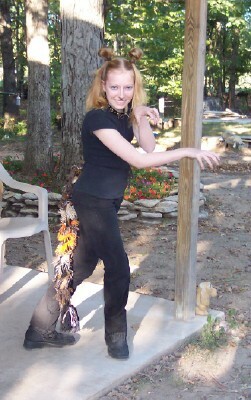 (You should see what the Lady Shaman were wearing, Mom and the girls made those, too!) Above is Mom modeling the Shaman Robes in The M.A.D. House Dance Studio. This is The M.A.D. 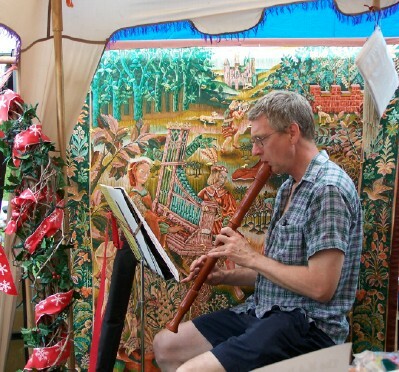 House Artists on the road with their store at an outdoor event. As Mom and Dad were incognito, their costumes were on Display without them. 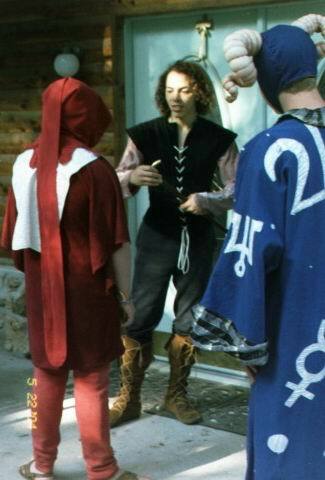 Pictured are Mom's Medieval Gowne, and Dad's Enchanter costume (seen above on one of our friends). The horned hat is available for purchase. Custom copies to your specs. Be sure to email Mom at zelda@brightok.net if you need a costume estimate. Our Famous LLAMA SHIRT. Portrait by Mom of our younger llama, Magical Flag. 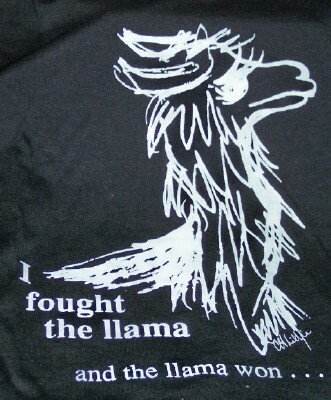 On our LLAMA T-SHIRTS page. The year Captain EO was made, Mom was working at Parson's Meares Ltd in New York as a costumer. The costume worn by Michael Jackson was made in that shop, and Mom got to work on the knees, the silver studs on the leather slacks, and the leather covered Reboks. To this day Mom keeps her leather needles in a plastic mold of Mr. Jackson's kneecap. 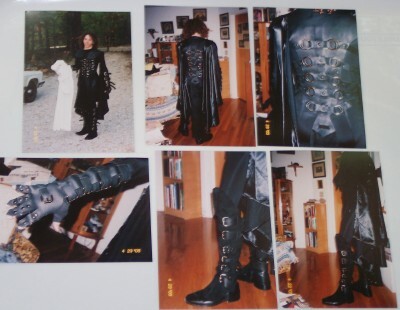 The kneecap molds were used on the costume, first covered with leather and then attached to the white leather pants. Sally Ann Parsons and Jim Meares had flown to California for the initial measurements and fittings, but Michael was not able to be in New York for the later fittings. Mom had the distinction of having the right measurements to substitute for Mr. Jackson in the New York fittings of the leather pants, and it fell to Mom to stand in for him as the costume was being fine-tuned for delivery. The leather jacket with its electric lights and circuits was made by Lee Dancer, the milliskin body shirt was hand painted right there in the 14th street shop, and, being August, the leather glue just would not dry as we worked through the hot muggy nights to finish the Captain's uniform in time. and you will be sorely missed. 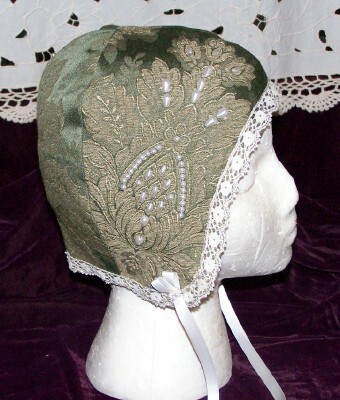 Mom is making Coifs (little hats) for men and women and Medieval Gownes, Renaissance Clothing, Wizard and Fairy Staves, and any other anachronistic thing you can think of. Saturday June 13th will found us showing our wares in the Craft Show at the Heartsworth House, 821 North Foreman, in Vinita Oklahoma to benefit the Alzheimer's Foundation. The Red Oxalis was a real hit, and the Heirloom Sweet Annie!